I already own Pandemic, and am told it and the Cure share ideas but have a different feel in play. I like the idea of more good co-op games, but not the idea of having a ton of games with the same theme. Here enters the retheme! I'm not a huge fan of wargames, but I do like super heroes. Most of the super hero themed games aren't ones I'd pick up, so this theme is ripe for using here. Your role, should you choose to accept it, is that of a super hero or SHIELD agent, tasked with preventing the spread of various nefarious organizations. I'd love suggestions for which Cure roles should go to which hero. I'm already working on a hex tile based world map for the 6 areas, so it can be split apart or tiled together. Then I'll need the CDC (a SHIELD helicarrier). Do people find the 'treatment center' area inside the tracker ring large enough? There are photos of so many dice that they're spilling out of it, but that almost seems like it might add to the tension of the game. - should I include just a part of the expansion? Maybe a role that's well balanced with the core roles? Maybe the extra infection? I don't know anyone who's played it to ask. Would love some input on things. I've watched most of the earlier Avenger movies (up to Avenger 3), but read none of the comics. It's been a while since I watched the movies, but pretty recent since I watched Agents of SHIELD. So please chime in with whatever fandom or expertise you've got, whether it's movie, comic, or game related! I'll post some pics as I get things together. I'm still considering art style, but leaning towards comic art vs movie art. Man. They really must have tried, in order to make these dice have so few different things, but to not exactly overlap with each other. It looks like Dispatcher (core) and Archivist (expansion) have the same dice, except for special ability, and Quarantine Specialist (expansion) and Field Director (expansion) share the same dice. I wonder if those two roles are worth the extra set of dice. Tempting. Here are my role assignments, after reading through everything, and tossing in some of the matching roles from the expansion (in italics). So some roles were assigned for being better at 'subduing', while others assigned based on flying, or flying others. Some assigned based on processing information. I rearranged some roles to fit, so people can play a very Agents of SHIELD based game, or a very Avengers based game, and that men and women can both choose to be super heroes. I'm pretty happy with it. Minis are ordered and on their way. I'm using Pepper Potts' Rescue suit for lady Ironman, as there wasn't a mini available. I'm trying to figure out what the medic cross icon on the infection dice should be. I had thought to make it the icon of the evil organization (because it'd look cool), but from the instructions, it sounds more like it needs to be something of use to the heroes (like a SHIELD logo). Also, if the CDC is the SHIELD helicarrier... what is the treatment center dice pool going to be called, in the middle of the infection track? Sounds like a neat project! Gave me a couple of ideas just thinking how a supers universe could totally be re-enacted in the cure. The various die colors as different villainous organizations, dice representing occupation and their acts of terror. I'd love to bring that kind of game to the table. As far as the expansion goes' just include all of it. It's like On The Brink of base Pandemic- it completes the game and adds a ton of replayability. The Hot Zone dice would compliment the theme amazingly, in my opinion. 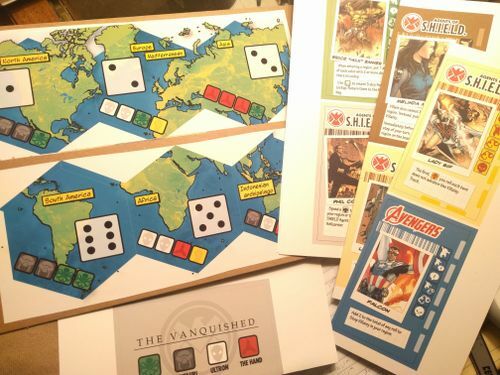 Have you tried Risk Marvel edition? It incorporates a lot of the Avengers movies character themes in with the basic Risk area control/ attacker-defender die roll mechanisms. I have only played it a few times but had fun. I've played Risk a few times a long while back, and it didn't grab me. Most of the components for Risk: Marvel aren't really doing it for me either, though I really appreciate the suggestion. Part of the reason I'm retheming The Cure is because I like the idea of more co-op in my game collection. A lot of superhero games are everyone against each other, or some seem like 'collaborate for a while but one guy "wins" because points'. Trying to finalize dice colors, so I can label the map appropriately. The original The Cure color is first, followed by the Evil organization, then the new dice color and a secondary design color. Someone told me AIM is mostly an offshoot of the sciency bits of Hydra. So I swapped some things around. Thanos apparently works through other badguys to get what he wants, which works well for the expansion disease. And hey, still kind of purple. Hydra in SHIELD is a bit all over, and so has the disease dice which hit the most continents, blue. Thinking hot zone dice could still be called 'hot zone'. Slowly chipping away at this. Here's a try at the map. I added Australia, and did my best to cram in as much as I could. The continents aren't very cooperatively hex shaped. They might be a little too busy, but it's a good start. This way they can be broken apart or placed together. Still deciding how to handle the other parts. Collecting images for the roles. Working on standard icons for the dice. This is looking nice! I really like the idea of the hex grid instead of the way it's arranged in Pandemic: The Cure. 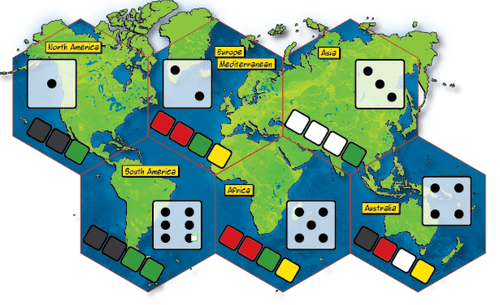 Thanks for including NZ on your map - most game boards leave us out (there is a geeklist about this). You might consider renaming "Australia" to "Australasia" to include the other countries in that hex. Thanks! Both Japan, New Zealand, and Alaska were the ones I did my best to keep in. But I also wanted the land masses to be large... there's an awful lot of ocean on this planet. So I sacrificed a fair chunk of the northern end of the North American continent. Here's a draft of the role cards and the dice icons. Still need to work out the specials. And rewrite all the descriptions. And all the things. In particular, I need a picture for the 'treatment center', which I kind of want to be 'lockup'. I recall a tall building used in the SHIELD show where some of the special people were locked up, but having trouble googling it, or finding a pic. Or "Oceania" if you want to be even more inclusive. I like Oceania as being inclusive, as well as Australasia. I'll have to review the names I'm using to make sure I'm consistent. I'd kind of like to keep it as Australia, and add another label to include the islands, but I'm having trouble finding a name that includes the greater part of the islands, that is also recognizable. biohazard [die face, move infection track] -> Skull? Infect Regions [step in the] turn -> Villainy spreads? I hope you're still working on this project. It's a fantastic idea, and I've started doing something similar on Tabletop Simulator (For personal use only, naturally). I was thinking it would make sense to use the 'A' logo on the infection dice, in lieu of the CDC cross. A SHIELD logo makes sense too, though. The annoying thing is, once I have an idea like this stuck in my head, I can't get rid of it until I've agonized over every detail. After a sleepless night where I couldn't switch off my brain, the following is a list of all the roles from both the base game and the expansion, with two heroes that felt like the closest fit to me. I liked the idea of having double-sided cards, so players have a choice of which hero to use. Most of the heroes were chosen by what felt right. For example the Field Operative doesn't work well with others; it makes sense to use Frank Castle / Jessica Jones. In the Medic's case, we're talking about someone capable of subduing a crazy amount of suspects at once, so the Hulk / She-Hulk feel like a good fit. Neat! I wasn't sure I wanted to use up so many dice, so I stuck with the subset of the expansion roles. I'm glad I did, it's surprisingly time consuming making up all the double-sided cards. I like some of the roles you added. I considered some of them myself. I had a bunch of different things I was trying to do with the double sided cards. - Keep colors that kind of make sense for each side to share, as well as kind of go with the minis I got. - Make the skills of the two sides make sense for their roles. - Allow people to play an all SHIELD game, or an all Avenger game. - Give people lots of options for playing men and women (and gods) of various representation and earned or granted abilities. - Tried to find art consistent in quality between all of them (hard, with people like Fitz and Simmons and such). Here's a low-res work in progress. For the lockup, I'm probably going with The Raft. The imagery for 42 didn't catch me. I'm still deciding on the look for the tracks. I can't make out all of the names on there, but I'm guessing you're using the same ones as before? I've got my track and map more or less completed. The red/blue spots are counters in lieu of the syringes that the base game uses. It doesn't exactly feel comic book, but at least it looks half-decent. Yeah, I didn't change any roles, just moved Thor/Sif together and Falcon/Cap together, because the colors of the minis suited better, though the powers worked better the other way. My dice came! And they came in a different ratio of colors than I had expected, so then I had to redo all my choices for colors. Set me back a few days of tinkering, but it'll look nice. Mulling around the idea of making a wood peg board for the two trackers, but having trouble with shape. I'll figure it out eventually. At least we have access to a drill press. During a marathon of marvel movies over the last few days, I finally finished off the last few bits that I needed to do. I'm especially pleased with how the Event/Support cards came out. I was dreading tackling them, but almost all of them turned out quite nicely. If anyone has Tabletop Simulator, you can check it out on my workshop page. Neat! I'm going to finish this at some point, but it's more of a slow project for me, as it's less likely I'll be able to play it any time soon. I'm working on Abandon Ship at present, and peeking at this when it feels fun. And playing much Zelda: BOTW. Finished retheming Abandon Ship, and helping out with a mint tin Barbers game, and putting another polish on my skateboarding game... back to this! Here's what I have for the trackers. I liked their design decision of pegs, to keep the tracker from getting knocked about by dice. I'll likely have it cut from wood and drill the holes. Also, the 'cured' card. I liked what another user had done with the information in the center about how the center works, and so I incorporated that. Last bit to tackle, Event Cards! Making progress, printed out the things that don't need a bit of photo manipulation, that I'm done with. Really happy with how things are coming along. A lot of work left to do on the event cards. ...this is a lot of dice to sticker. Maybe halfway through. Still deciding on how I want to make the peg board. I think it might need to be paper glued to wood, then sandwiched between the wood, to keep the paper from shredding as it drills. I wish my hand drill hadn't gotten rusted by a rogue over-night water leak. About halfway done making up Event cards, now called Support. Surprisingly time consuming for only 21 cards, because they're all unique. Anyone have any good add-on cards they made? I gather Experimental Meds came with blanks.